It's that time again! The time for another great "one sheet of paper” tutorial. This month I had to go to a few events and I made a few cards. That led me to think…how can I make beautiful cards and still save up my supplies. 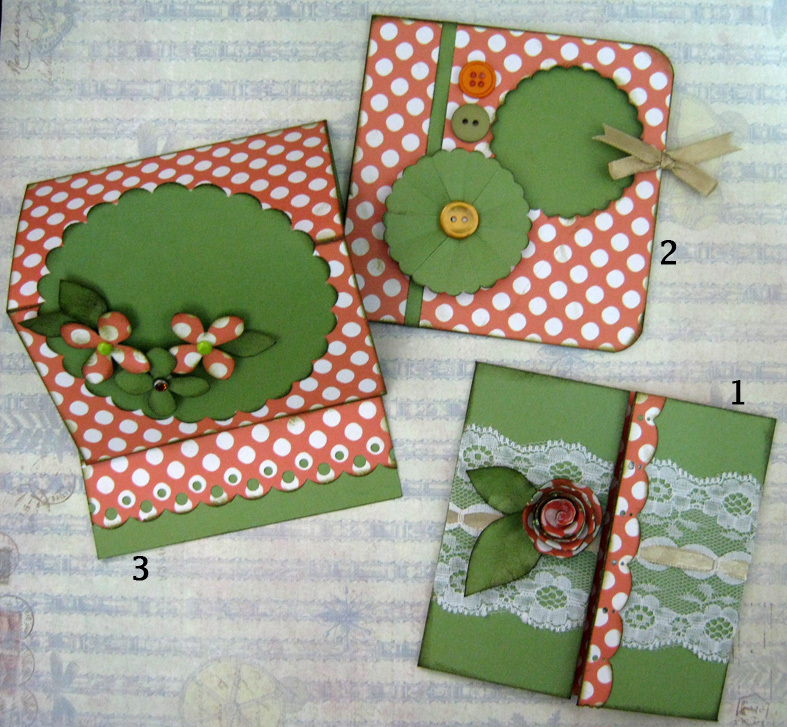 Well, the answer is to use one sheet of paper to design three different cards and the leftovers to create the embellishments. 1 sheet of double sided cardstock. Cut a 12" by 8" rectangle. Cut it to three rectangles 4" by 8" each. 1. Take one rectangle. Fold on the 2" line and on the 6" line to create two flaps that open outward. 2. Add a lace ribbon around the card. 3. Create a border from the remaining cardstock. 4. Add a spiral flower. You can find the instruction for the flower on the 101 Flower tutorial: spiral flower. 1. Take second rectangle. Fold in the middle on the 4" line. 2. Punch the upper right corner of the outer flap. 3. Use the punched piece to create a flower. 4. Add buttons and a ribbon as a border. 5. To complete the look tie a piece of ribbon through the hole. 1. Use the last rectangle piece. Fold on the 2" line and the 4" line. 2. Cut a 4" 1"4 strip from the scrap paper. Adhere on the edge of the card, on the inside. This will keep the card standing when you open it. 3. Punch a scalloped circle from the leftover paper and adhere to the card. put the adhesive only up to the 2" fold line. This will make the circle pop when you open the card. 4. Punch flowers and adhere to the circle with 3D adhesive. Add bling or brads. There you go, three great cards from only one paper! Saves you time and money! Great use of CS. I especially liked the first card. Thanks for the inspiration! Love them! Thanks for the inspiration. כרטיסים נהדרים. מדהים שהכל מדף אחד!!! Great cards... and one ONE pc. of paper! AWESOME!! Another idea that I am going to try!! Thanks for the detailed instructions!